The Battle of Puebla occurred on May 5, 1862 during the French intervention in Mexico. Although the Mexicans were eventually overrun in subsequent battles, victory at Puebla was an inspirational event for the Mexican troops. Some scholars also believe that in the long run French defeat at Puebla influenced on the outcome of the American Civil War. The holiday's name, Cinco de Mayo, is translated from Spanish as “fifth of May”. In Mexico, Cinco de Mayo is referred to as Battle of Puebla Day. It does not have the status of a federal holiday and is celebrated mainly in the state of Puebla. However, it is a popular celebration in the United States. It was first observed in California in response to Mexico's victory in the battle. The holiday started to spread across the United States in the mid-20th century and gained popularity in 1980s, when marketers began to promote it. 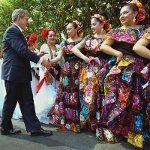 Cinco de Mayo celebrations include events that focus on Mexican culture and heritage, especially dancing and music.